I have been so behind in posting my new work. I thought maybe I would submit some to a magazine that wants never before seen work, but I have a hard time not sharing my work immediately. It's the gratification thing. I like to share. I love when people comment! I love commenting on other's work! So, I will share my newest Nikki Sivils projects with you now and then a few other projects that I finished this past month! 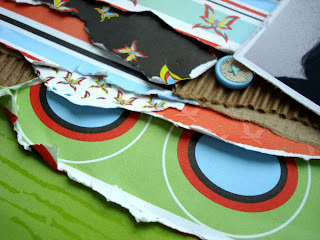 I adore the new products from Nikki Sivils Scrapbooker! I love layers of papers and textures. I used lots of scraps for the layers here of the various Flaming Butterflies line! It needed more texture (IMO) and I had a coffee sleeve so I ripped that up and added that to give some interest. 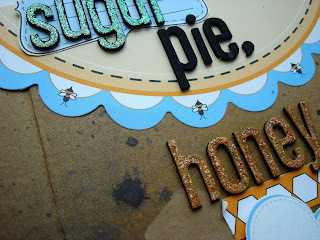 The Cutie Cut Ups are so fun to cut out for embellishments. The colors in this line are so bright and bold! Here's a detail of the layers. Next up is a layout from Willow Bee line. I love the graphics in this line.The honeycombs and the bees are so fun! I knew I wanted to do a page about my husband and his love of singing under the influence... LOL. He always sings "Sugar Pie Honey Bunch" at weddings and with friends. It's a riot and cute. So, I started with a distressed piece of cardboard (from my mailing box- nothing goes wasted in this house!) for my back ground. 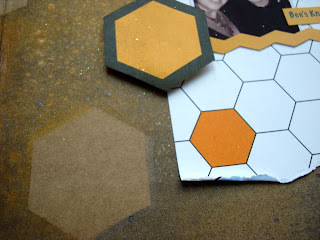 I cut some of the honeycombs out from the Cut Ups sheet and layed them out on the cardboard face down. I sprayed with Cinder and Mimosa glimmer mist. After it dried, I removed them and used them on the page right side up. The papers are from the line but also from the 6" x 6" book of papers too which are the same designs only smaller for card makers or mini albums. I love to mix the small and large prints. For the letters, I used foam Thickers and Stickles. The diamond colored ones were perfect for sugar and the Marigold distressed Stickles were great for honey! I also used a 10" circle die cut paper for the top... I just cut it in half. I create this little banner with accordian flowers ( you can find a tutorial here) and lots of little punched and cut out embellishments. The clovers are made with a little heart punch that I punched 3 times and then hand cut a stem. I glued them to the back of the burlap button to make the clover. Easy Peasy! The letters are Rusty Pickle and glitter added. All the papers are Nikki Sivils- My Sweet Cherry Pie, North Pole Lights, and Henry's Brillance. Punch holes in edges and tie with ribbon! A cute St. Patrick's Day decor! Here is a layout that I did using Studio Calico's February kit. I think it was a sketch challenge over there but I didn't get it in time, so I just did it for fun. It's kind of linear for me, but I like the papers in the kit and painted the letters for this layout with a soft pink. It's a soft layout and the photo is from back before I had kids! It was a girl's weekend out at Niagra on the Lake at a spa named the Pillar and Post. Those were good times! I ws much more relaxed then. I did treat myself to a "me day" yesterday. I went to Weight Watchers (lost another 1.2 lbs!) and the gym (Ouch!). I then went and got a manicure/ pedicure- sigh... so blissful! Lastly, I cropped the rest of the day and night with my good friend (the kind that makes your sides hurt laughing so much), Sherry. While she offered up her house (with no kids or husbands! ), food, and time, we created stuff and laughed. I was so relaxed and happy! We ordered Chinese food for dinner and drank beer. YUM! I finished a mini album and she did a ton of cards and a project for classes she is teaching. I felt renewed and it was so needed! Thanks Sherry!!! HUGS! Today is the last day for official hockey season for Mark. Matt got skates and a helmet so he can skate with Mark today. They did offer an additional 10 week session so we will be doing that in addition to T-ball in the spring. It's gonna be a busy week.... I better get going to cheer on my guys! Wow I love all of it reminds me of taking a trip for some reason. Love your work! can't wait to work with you on Couture Cardstock! Congrats! 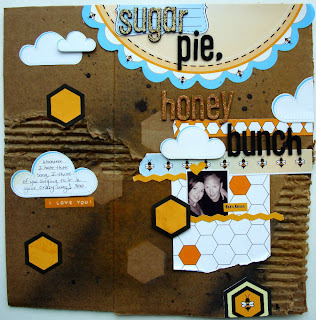 I am so in love with the fly and the honey layout. They´re just awesome! i just love your layering style!! !